I'm very pleased that the Maharashtra government is passing a law which makes the payment of cuts, kickbacks, and commissions to doctors an offense for which they can be punished. I've always been vocal about the fact that kickbacks have corrupted the medical profession and damaged the doctor-patient relationship. These cuts impose a burden on the honest doctors who refuse to give kickbacks ; and helps bad doctors who are willing to take shortcuts to enrich themselves. In the long run, it hurts patients as well , because the cost is passed on to them, and they end up paying for these under the table bribes. 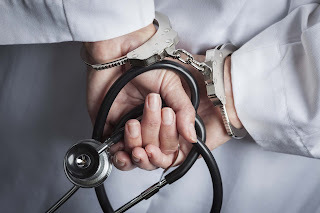 A practise which was started by a few bad apples has spread wildly like a cancer, and caused irreparable harm to the reputation of the entire medical profession. Kickbacks seem to have become institutionalized , and it's become very difficult for an honest doctor to survive in private practice without giving these. It's because this has been going on so blatantly for so many years that the government has finally had to step in and take stern action against this practice - or should I say malpractice ? However, sometimes the cure is worse than the disease. Government actions may be well-intentioned, but they usually end up back firing, because all they are able to do with their ham-handed laws is pass regulations which punish offenders when they are caught. However, this is doomed to fail in real life, because kickbacks are exchanged between two willing parties ! How does one document the kickback? Who will complain ? and why would they ? and how would they prove the cut was given? And does one punish the person giving the kickback ? or the person taking it? This is a difficult and complicated situation, and part of the problem is that the government is being short sighted by only addressing the symptom , rather than the underlying cause of the disease. We need to step back , and rather than think about punishing people because they've given or taken a kickback, we need to think about what we can do to remove the need to give kickbacks ! This would be far more productive approach, because this is a better question to ask , and a more useful problem to solve. The government needs to take enabling positive steps, rather than pass punitive legislation , which only punishes people after the event. Why not stop the event from occurring in the first place? Let's go back to first principles. The only reason people give kickbacks is to increase their business. Thus, specialists need referrals from GPs, which is they give kickbacks to a family physician ; a hospital gives a cut to a specialist, in order to fill their beds; and pharma companies and medical device manufacturers want doctors to prescribe their drugs and products , which is why they incentivise them with commissions. The government needs to get rid of the middlemen in the healthcare system, if it wants to clean it up ! The best way of doing this is to enable patients to reach out to good doctors directly. Then there would be no need for these good doctors to either give a kickback, or to accept one ! It's possible to do this digitally today. The government should publish an online directory of all qualified doctors registered with the Maharashtra Medical Council , or order the MMC to do so. This would enable doctor discovery, so that patients would be easily able to find the doctor who is right for them , from the comfort of their home. Obviously, a bare bone listing is not enough ! The doctors would be mapped, so that patients can make a short list of doctors who are in their locality, and start contacting them. Patients would be encouraged to rate the doctors they have seen, so that other patients can get information about how patient-friendly the doctor is. These comments and ratings would be moderated, so that they are of high quality; and doctors get a chance to respond to complaints. This simple step would be a great way of introducing openness and transparency into the system, and doctors would be then far more likely to treat their patients better, because they know they are being evaluated by them online. The next step would be to encourage doctors to have their own websites , and the directory could link the doctor's name to his personal website. This would allow patients to learn a lot about each doctor, so they could compare them without having to go physically to their clinic. We have a new generation of young doctors who are willing to connect digitally; and we have empowered internet savvy patients, who don't want to waste time travelling to a doctor's clinic. A doctor's personal website will help to kick out the middleman by enabling direct doctor-patient communication, and this will help to create trust. Doctors will not be able to lie on their website, and this will help to keep them honest ! The government needs to provide Information Therapy on their website, so that this becomes a trusted source of reliable information about health and illness. It should become the port of first call whenever any patient has a health related query. The site should be in local languages, and will allow patients to learn about their symptoms, diseases and treatment options even before going to their doctor ! The website could cover lots of things, such as the average cost of medical procedures , so that patients are better prepared. It could also act as a nucleus around which patients can create online communities and talk to each other, thus helping each other when they are ill. This is the kind of positive proactive patient friendly step which a government should take , because it has the power, the responsibility and the duty to do so, in order to keep its citizens healthy. This step will help patients to find the best doctor ; and help doctors to get patients without having to give kickbacks. A progressive government will use technology cleverly to heal the healthcare system , by helping both patients and doctors. This platform will help to reduce costs for patients, because they will be able to connect with experts who can provide video consultations. It will assist patients in small towns , as they will not need to travel to cities to get second opinions from leading experts. Junior doctors who have free time can create patient educational materials, and share these on the platform . This will help them to attract more patients . Finally, this will also improve the productivity and efficiency of the interns and resident doctors in government medical colleges, who will be able to serve the needs of villagers remotely, by using leveraging telehealth tools, thus reaching out to the poor and underserved. The government needs to adopt technology to empower patients and good doctors, rather than waste time passing laws which look great on paper , but never actually achieve anything because they're toothless tigers. Unfortunately, today our whole attitude towards doctors has become so negative , that we refuse to try to help them, and this is such a shame !